Yellow perch produce eggs in gelatinous ribbons, but so far nobody knows why. We explored this peculiar trait by conducted some experiments to see if these ribbons protect eggs from predators. Helpless and delicious. 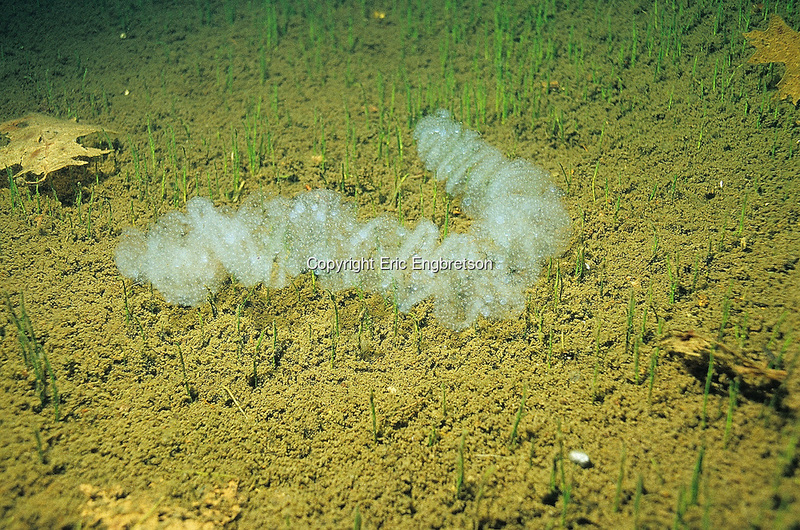 Fish eggs and larvae are an energy-rich meal for predators. For some species, predator consumption of eggs and larvae can reach up to 30% of the available young fish per day. Many species of fishes have adopted a variety of protection mechanisms to increase offspring survival. Some fish dispersing eggs broadly, build nests, and even carry eggs in their mouths for extra protection. Assuming that a fish has a limited amount of energy available for reproduction, there is a trade-off between the total number of offspring a parent can produce and the amount of energy spent protecting or ensuring survival for each individual offspring. Egg cases –slimy, gelatinous armor? Providing eggs with protective cases can be less energetically expensive. Egg casings are found in many aquatic invertebrates, but only in a few species of fin fishes. Yellow perch and Eurasian perch may be the only freshwater fish to produce protective egg cases. Their egg cases, called “skeins” or egg ribbons, are gel-like egg matrices, yellowish and translucent. Females drape their egg skeins over vegetation or other structures during the act of mating while the male closely follows her releasing his sperm. We wanted to know if the skein provides some actual benefit to egg survival. A mass of Yellow Perch eggs contained in a skein. Source. We examined the willingness and ability of calico crayfish and round goby to consume yellow perch skeins. Both species are notorious egg predators (see stats in their player cards), and represent two different ways of sensing eggs. Crayfish probe for eggs with their anteanea and manipulate their prey with pincers. On the other hand, gobies consume eggs by gulp feeding. Accordingly, the two predators may be attracted to or deterred by perch egg skeins in different ways. We used two experiments to examine predator responses to perch egg skeins. In the first, we offered each predator three different egg types: yellow perch eggs in the skein, yellow perch eggs removed from the skein, and fathead minnow eggs. Fathead minnow eggs are about the same size as yellow perch eggs, but do not have any protection surrounding them. We found that yellow perch eggs in the skein were often approached first by both predators. But in terms of actual consumption, both predators preferred to eat yellow perch eggs with the skein removed and fathead minnow eggs over yellow perch eggs in the skein. We developed the second experiment after observing an interesting behavior in the first. Crayfish were rarely successful in consuming yellow perch eggs in the skein. However, they usually spent several minutes struggling to extract perch eggs from the skein, stretching and pulling it like the toughest, but tastiest piece of beef jerky. Eventually, the crayfish would abandon the eggs for a more accessible alternative. However, this process damaged perch eggs. Fish eggs are quite fragile and even those protected by a mass of durable jelly-ribbon can be damaged too severely to survive. Thus, although the eggs were not consumed, destruction led to the same result. The second experiment examined whether damage could also be prevented by predators becoming familiar with the futile struggle to separate eggs from the skein. We documented whether crayfish would spend less time struggling with yellow perch eggs in the skein one day after prior experience with the egg skein. As hypothesized, crayfish spent less time trying to eat the eggs on the second day, potentially indicating that predator familiarity with yellow perch eggs may also reduce damage. piperidine (a component of the toxin coniine produced by poison hemlock). This analysis was very preliminary, and further analyses are needed to fully verify which substance or combination of substances may actually provide protection. However, we observed that round gobies would spit out the egg skein soon after it entered their mouths, as if they popped a hot out-of-the-oven tater tot in their mouth. This behavior is consistent with the idea that chemical compounds may provide protection. What does it all mean? We observed little to no predation on yellow perch eggs in their skein by round goby or crayfish, potentially indicating that yellow perch skeins have decent predator defense qualities. This again raises the question ‘Why is this so rare in fishes?’ We did not examine how much energy is required to create the egg skein, which may illuminate why this adaptation is unique. Future studies should examine if other predators also reject yellow perch eggs in the skein and further delve into the potential molecular mechanism providing protection. Apparently, this rare ability to produce an egg skein actually provides offspring with an effective defense mechanism. –by Zoe Almeida, guest blogger. Zoe conducted this research as a MS student at Purdue. She is now working on her PhD at Ohio State where she’s studying how food quality for young walleye in Lake Erie may affect individuals and the population in relation to changing climate conditions. Previous Post The 7 Wonderful Pikes, Pickerels, and Muskies of the World!